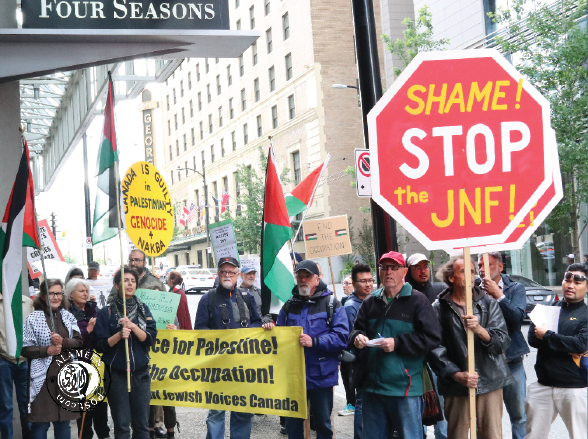 On JUNE 3 -2018 Canada Palestine Association along with other lower mainland organizations gathered in front of Four Seasons Hotel at 791 West Georgia St. at Howe in Vancouver to picket the Jewish National Fund Dinner which is celebrating the "70th anniversary of the state of Israel". According to the organizers of the protest JNF is attempting to hide its policies and history behind a charitable project, this time to "Help Improve the Lives of Children with Disabilities". They are calling on the Canadian Government to revoke the tax deductible status for the JNF. The Originator is He of the heavens and the earth: and when He wills a thing to be, He but says unto it, "Be" -and it is. The Prophet said, "A Muslim is the one who avoids harming Muslims with his tongue and hands. And a Muhajir (emigrant) is the one who gives up (abandons) all what Allah has forbidden."